Caffeine lowers death risk from kidney disease - Healthcare Asia Daily News | Asia's Leading News and Information Source on Healthcare and Medical Industry, Medical Technology, Healthcare Business and R&D, Healthcare Events. Online since 2010. : Healthcare Asia Daily News | Asia's Leading News and Information Source on Healthcare and Medical Industry, Medical Technology, Healthcare Business and R&D, Healthcare Events. Online since 2010. Consuming greater amounts of caffeine, including soft drinks, tea, and coffee, may help reduce the risk of death for people with chronic kidney disease, according to a study. The research, which was published in the journal Nephrology Dialysis Transplantation, attempted to associate the coffee consumption and mortality of those with the disease, matching previous research that showed the relationship in the general population. The results have been shown to be related to vascular effects because caffeine is known to promote the release of substances such as nitric oxide, that improve the vessels’ function. About 14% of adults have chronic kidney disease in the US, according to the National Institute of Diabetes and Digestive and Kidney Diseases. Approximately 468,000 individuals are on dialysis. “The decline in mortality was present even after considering other important factors such as age, gender, race, smoking, other diseases, and diet,” said study author Dr. Miguel Bigotte Vieira, in an Oxford University Press release. The study consisted of 4,863 Americans with an average age of 60 from the years 1999 to 2010 at the National Center for Health Statistics of the Centers for Disease Control and Prevention. Over a 60-month follow-up, 1,293 participants died. 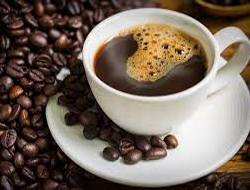 The participants were broken down into four groups based upon caffeine consumption: less than 28.2 mg per day, 28.2-103.0 mg, 103.01-213.5 mg and more than 213.5 mg. The average caffeine content of an 8-ounce brewed cup of coffee is 95 mg. A single espresso or espresso-based drink has 63 mg, and decaf coffee includes about 3 mg of caffeine. Patients who consumed higher levels of caffeine had a nearly 25% reduction in the risk of death over the follow-up months compared with those who consumed less caffeine.